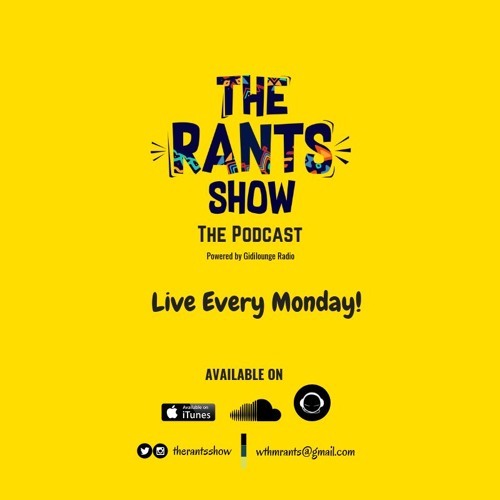 On this episode of @TheRantsShow, we talked Menstral Awareness, Womanhood, Budgeting, Why Men Don't Marry for love and even got a chance to squeeze in some stalker tendencies with our guests @duchesskk and @t0nit0ne Listen and Enjoy! Send anonymous stories/thoughts/questions here. curiouscat.me/TheRantsShow #TheRantsShow Follow TheRantsShow! Sanmi (The Wordsmith) Twitter- twitter.com/adewus4real IG- www.instagram.com/adewus4real/?hl=en Toni(@duchesskk) Twitter- https://twitter.com/t0nit0ne IG- https://www.instagram.com/t0nit0ne/ Karo (@duchesskk) Twitter- https://twitter.com/duchesskk IG- https://www.instagram.com/duchesskk/ The Rants Show Twitter- twitter.com/TheRantsShow IG- www.instagram.com/therantsshow/?hl=en Send all your questions to and comments to: wthmrants@gmail.com Use the hashtag #TheRantsShow to connect with us AND while you listen to the podcast! This is a WhatTheHeckMan Media Production.